The weather was much improved from last year, hopefully a sign that there might be much more to come during the upcoming season. With winds of around 12 knots and an ebb tide that was dying off throughout the race, Tim O’Leary planned a 2 lap course upriver and back which proved to be perfect for the conditions. 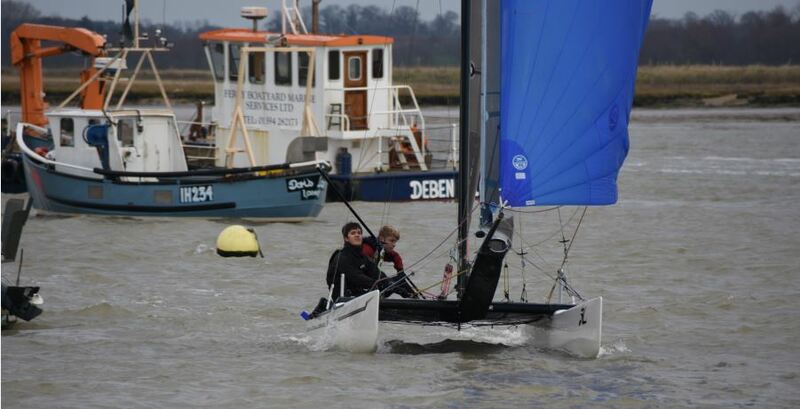 Despite the mild cold, we had 15 determined sailors turn up to race: 4 Dart 18s, 1 F18, 1 Sprint 15 and 2 Laser 2000s. With everything looking good to go, this really did show promise of being a great race! With just a minute to go, everyone neatly lined up on the line until Sam Rowell tacked to keep clear of the can and to get closer to windward, causing Sam Walker & Sam Morris to tack off and start right at the back of the fleet. Across the line first was Simon Rowell in the Sprint 15 and Mark & Nick Swain in their Dart 18. Following shortly behind, was Bev & Doug Chesterman in a 2000, starting ahead of most of the cats. 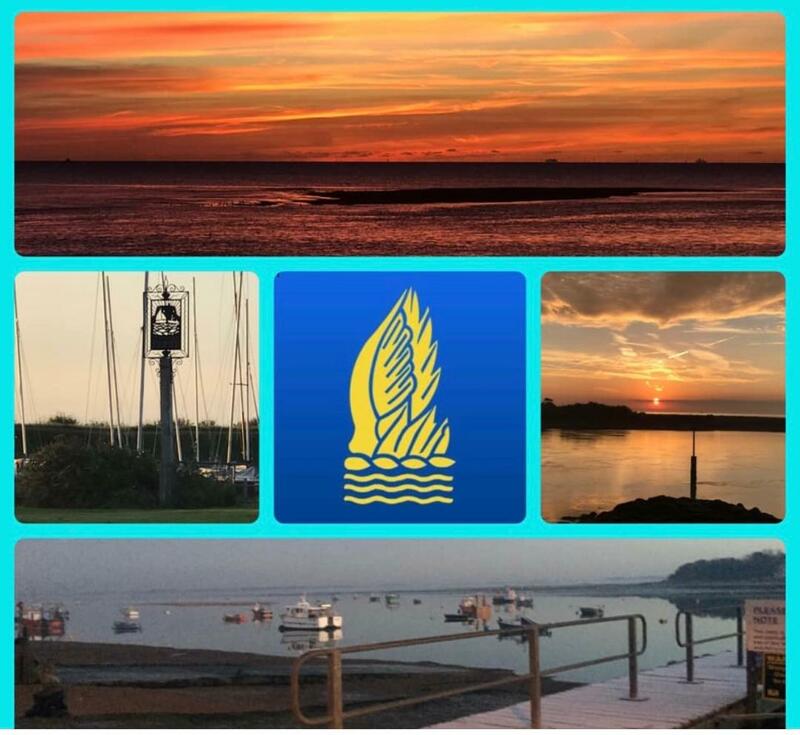 The course consisted of a mark off Bawdsey Quay, a short distance from the start, and then a large upwind leg to the tug buoy at the end of the moorings. The upwind leg was hard fought with some tide still flowing, but the F18 broke away from the fleet, from the onset, and left everyone else behind them. Once round the tug, spinnakers were quickly hoisted, for those who had them; it was a quick blast back across the line to a mark off the Bawdsey sand spit before all being done again for a second lap after passing the Deben can but this time, against a weaker tide and a bit less breeze. First around every mark and taking line honours was Zac Monk & Ed Swain in their F18 Hobie Tiger; their lead was just enough to place them 6 seconds faster than Sam Rowell and Lu Mustill after handicap, with Ed Swain claiming the New Year’s Day title once again. The award for determination goes to Michael Macleod & Gabby Robinson who also have a head start on most demastings this year, after his mast fell down in the dinghy park upon moving his boat. Despite this very minor setback, Michael managed to get his mast back up, with some help, and made it with time to spare onto the start line. They put in a good effort, with the crew being quite new to sailing, but eventually retired after racing a lap due to the cold. Thanks to all participants in the racing. 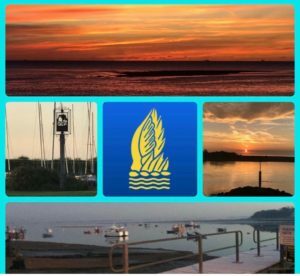 Special thanks to Tim O Leary and the Crow’s Nest Team for organising the racing and making sure it actually happens as well as the Safety Boat crew and are there for us if anyone’s masts fall down on the water. Thanks to Jim Morris and Alasdair Nicol for the photographs of the racing.